Students sometimes wish they’d done a bit more research before studying or working in another country – and we have a great online resource to help you do just that! Business practice and workplace etiquette? Suitable gifts when visiting someone – and which flowers can cause offence? Bargaining when shopping – is it expected or unacceptable? Eating out – and whether or not people share the bill? Conversations and discussions – and whether it is OK to interrupt another speaker? GoinGlobal can give you the answers to these and many more questions. 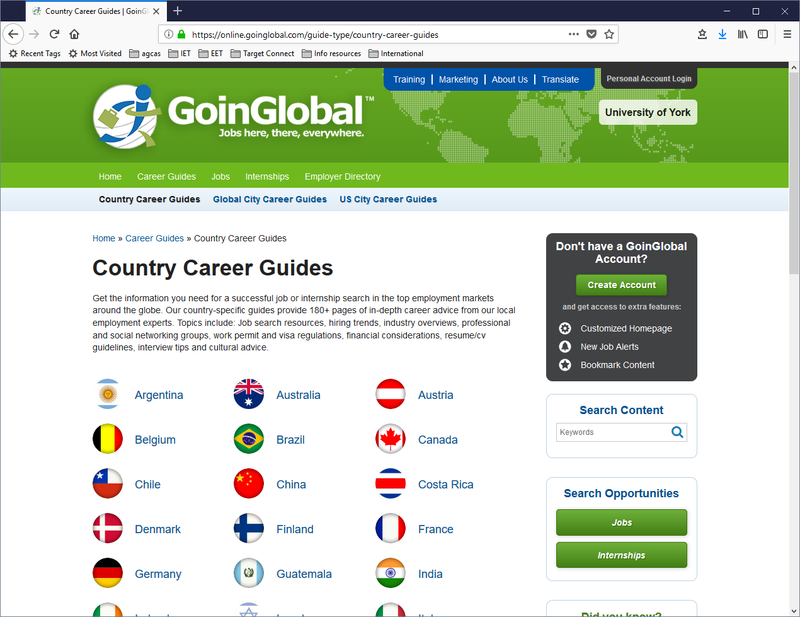 GoinGlobal features country career guides, a jobs and internships database, lots of information about finding work and business culture as well as practical information such as healthcare and cost of living. From the home page select Country career guides and choose from a list of 40 countries. You will be able to access job search resources, information on growth sectors and areas where your skills could be needed, advice on CVs and interviews, and overview of visa requirements and information on living in that country – all compiled by people who live there. Similarly, the City guides (mainly US cities and around 30 more cities worldwide), provide a toolkit of jobs resources and cultural advice. Access GoinGlobal from our International work page and see what you can discover. ← The York Award: What’s it really about?